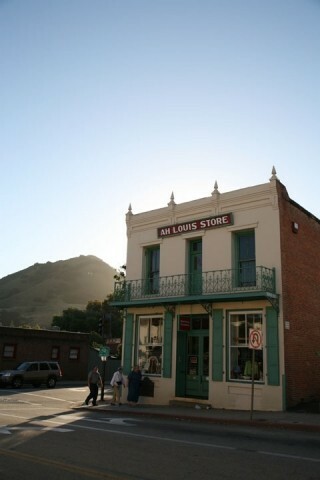 When locals and visitors alike stroll the sunny sidewalks of downtown San Luis Obispo, they easily catch stunning views of the towering mountains and sky-high ridges that define our setting in a fertile valley. REACH FOR THE SKY : Closed-door negotiations between SLO city officials and developers are hammering out all the details of â€œChinatown,â€? a five-story 78-foot development which would require raising the downtown height limit. # With its bright streets and low rooftops, downtownâ€™s ambiance and pedestrian-friendly scale attract people and accolades from all over the countyâ€”and all over the globe. But in the midst of all this charm, tough questions are seeing the light of day. Is SLO Town stuck in a cowtown past? Just what is our view on our views? Is it high time to increase our stature and change our attitude on altitude? 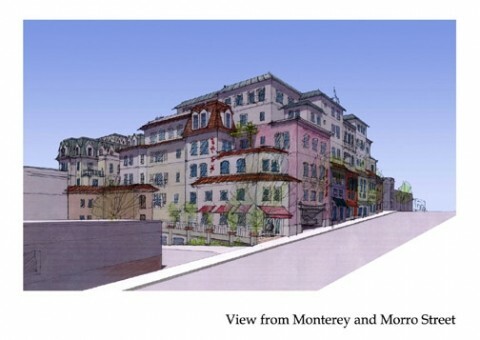 The SLO city council is getting ready to raise the roof on downtownâ€™s height limit. Theyâ€™re looking at saying yes to towering new 75-foot-tall buildingsâ€”thatâ€™s the elevation of the tallest eucalyptus trees in Mission Plaza, half again as high as the new parking structure on Palm Street next to the library. City planners say that thereâ€™s a development boom, which they attribute to earthquake retrofit requirements and â€œmarket forces.â€? Whatever you call it, the bottom line is the same: three votes from the city council for upping the height limit would change downtownâ€™s characterâ€”and create millions of potential dollars out of thin air. # views of ridges and mountains, street trees, pedestrian ambiance, the sense of small-town atmosphere,â€? said SLO planning commissioner John Ashbaugh. â€œThereâ€™s a certain tipping point where thatâ€™s lost. Iâ€™d like to see us taking a good long look at those issues before we commit to projects that threaten them.â€? Proponents of the change maintain that allowing buildings to rise higher than the current two- and three-story height limit downtown will increase economic vitality and create areas for more downtown housing and hotels. â€œItâ€™s a good thing for our community,â€? said SLO Mayor Dave Romero. â€œWe donâ€™t want to look like a pueblo forever.â€? Romeroâ€™s staff has been meeting behind closed doors to hammer out deals with downtown developers. Theyâ€™re working out the details of two massive new 78-foot-tall mixed-use structures, which would cover most of two square blocks where city parking lots and one-story buildings are now located: one, a project known as Garden Street Terraces, on Broad and Marsh streets extending to Garden; and another, a project referred to as Chinatown, on Palm, Morro, and Monterey streets. Not everyone is excited about the plans, however. One professional planner (who asked to remain nameless) compared the confidential negotiations for high-rises to â€œan elephant stepping on our communityâ€? 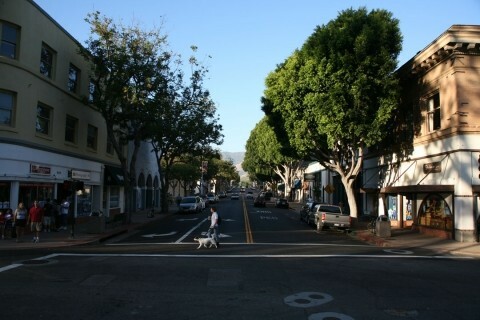 while a former planning commissioner calls it â€œManhattanizing downtown SLO.â€? At least 10 other new buildings of various sizes are in the works downtown. Although details are sketchyâ€”because none of the proposals has come up for public hearings yetâ€”the city staff says that most of the projects are taller than the current 50-foot height limit would allow. # From Romeroâ€™s viewpoint, these structures would not have a significant impact on the appearance of downtown. â€œSix to seven stories is appropriate,â€? he said. â€œYou donâ€™t need to worry about Wall Street-type shadowy streets.â€? But for some people, the loss of sunshine on the sidewalksâ€”especially in the winterâ€”is exactly what theyâ€™re concerned about. Others talk about preserving the pedestrian-friendly scale downtown. â€œWith one- to three-story buildings, people are in scale with the environment,â€? explained environmental psychologist Dr. Daniel Levi, a Cal Poly professor. â€œThey feel part of the place, not intimidated or overwhelmed. 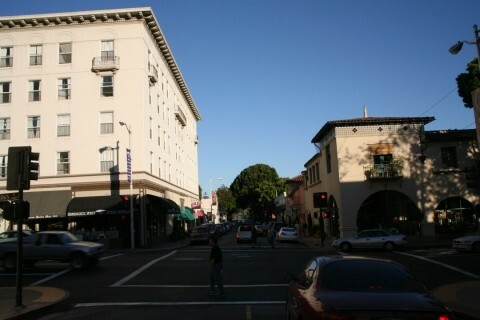 From a marketing standpoint, San Luis Obispo tries to display a small-town feel, which is usually one to two stories. 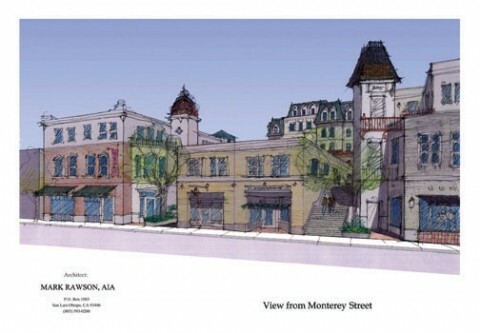 If downtown converts to four- to five-story buildings, itâ€™s no longer a rural downtown market. If I were a city official, that would be my biggest concern. What we gain in increased density, we lose in charm.â€? In the opinion of Vicente del Rio, an architect from Rio de Janeiro on the faculty of Cal Polyâ€™s City and Regional Planning Department, if San Luis Obispo had more housing downtown, the increased density might mean better bus service. â€œThereâ€™s nothing wrong with height and density, per se,â€? he said, â€œbut itâ€™s very Third World to think, â€˜We shouldnâ€™t stay a pueblo forever, so letâ€™s have a traffic light and tall buildings as a symbol of progress.â€™ Those are metaphors for problems cities try to avoid, like congestion and land speculation. â€œGreed is everywhere,â€? del Rio added. â€œWe just have to know how to control it.â€? # Heâ€™s calling for local decision makers to use computer modeling to guide building approvals, with a block-by-block simulation of how people walking on downtown sidewalks would experience the change in sunlight and views. Heâ€™s hoping to obtain grant funding for students to work on the simulation project. â€œItâ€™s a way of the future, so people can see what can happen,â€? del Rio said, â€œso the public can participate in decision making.â€? SLO planning commissioner Chuck Stevenson also favors a block-by-block computer simulation. The professional planner, who served on the cityâ€™s Architectural Review Commission, said that some blocks may be more appropriate than others for taller buildings. â€œI donâ€™t foresee a policy that would allow a one-size-fits-all height limit,â€? he added. However, the city planner responsible for writing a new height ordinance for downtown, Michael Codron, disagreesâ€”at least to some degree. â€œA block-by-block analysis is a larger project than what weâ€™re anticipating at this time,â€? he said. â€œA one-size-fits-all solution is certainly equitable. Thatâ€™s an important consideration.â€? Codron explained that heâ€™s looking at an approach that would require the inclusion of â€œdesirable featuresâ€? in order to received an entitlement for increased height, such as mid-block pedestrian access, promenades for creek access, energy efficiency, or â€œaffordableâ€? housing. As deputy community development director Doug Davidson said, â€œYou have to provide amenities, so itâ€™s not just â€˜Come in and get your 80-foot tall building.â€™â€? Planning, Davidson explained, is a process. So, in that light, what is the process that led to the city councilâ€™s decision to look at increasing the downtown height limit? The idea seems to hinge on a poster-sized drawing of the downtown core, developed by a group of architects and design professionals in the early 1990s. Known as the Downtown Concept Plan, it was never officially adopted as part of the cityâ€™s general plan and was never subjected to environmental review. # At the time, the colorful Downtown Concept Plan was referred to as a guide, but now it seems to be something more like a blueprint. It envisions new buildings in various spots downtown. It calls for city parking lots to be developed for parking structuresâ€”hence the confidential negotiations now underway for 78-foot-tall buildings on that land, including parking and retail, commercial, hotel room, and condominiums. In March, the city council voted 4-1 to direct staff to look at increasing the height limit to allow these larger structures, which are being proposed in the closed-door sessions. â€œWe have to deal confidentially until we come up with all the conditions to present to the public,â€? Mayor Romero said. â€œWe make sure the city is protected for revenues. The final action will be taken at a public meeting, but, yes, weâ€™ve already figured it out by that time.â€? Another part of the process comes into play with the cityâ€™s general plan, which calls for the downtown core to be the cityâ€™s most intensely developed area. But with recent approval of a five-story mixed-use development at Broad and Orcutt, limiting downtown to two or three stories â€œcould be seen as constraining downtownâ€™s ability to be the cityâ€™s most intensely developed area,â€? according to a staff report for the March council meeting. On the other hand, the general plan also states that new downtown development should respect the views of the hills, â€œframing rather than obscuring them,â€? councilmember Christine Mulholland pointed out. In addition, it says that new buildings should fit in with the existing vertical scale and shouldnâ€™t exceed 35 to 50 feet. â€œWhere necessary to protect significant views, sunlight, and street character, new buildings should be limited to two stories, 25 to 35 feet,â€? the adopted plan states. Mulholland, the lone vote against looking into the idea of increasing the height limit downtown, said that she doesnâ€™t hear city residents expressing a desire to build higher. â€œEveryone is saying, â€˜No, we donâ€™t need itâ€™â€”except developers and Realtors,â€? she said. â€œOthers are saying, â€œItâ€™s too much, itâ€™s too big.â€? Sheâ€™s especially concerned about the impact of the 78-foot-tall Garden Street Terraces. â€œFive stories on Garden Street would eliminate the wonderful eclectic shops people come downtown for,â€? Mulholland said. The elimination of Bubble Gum Alley as part of another new building project downtown is also disturbing to her, especially after the famous local landmark was featured in a full-page photo in Smithsonian magazine. â€œWe won the â€˜Best Downtown in the Nationâ€™ award from Sunset magazine,â€? Mulholland said. â€œSanta Barbara didnâ€™t win it. Portland didnâ€™t win it. San Francisco didnâ€™t win it. San Luis Obispo won it. Weâ€™re going to kill the goose that laid the golden egg.â€? She also takes issue with the idea that allowing buildings to rise five, six, or seven stories downtown will somehow prevent sprawl, saying there is â€œno nexus between the two.â€? Still, the advent of increased housing opportunities downtown is appealing to many local observers. Although at least three of the proposed new structures are hotels, some projects appear to incorporate a number of condominiums. Davidson, who until recently was the cityâ€™s housing officer, said that thereâ€™s quite a bit of interest in downtown housing. The new downtown developments could serve the housing needs of various groups: the local workforce, the elderly, single people, young couples, and empty nesters, according to planning commissioner Stevenson. â€œA majority of the new housing created downtown should be limited in unit size to promote workforce housing that is more affordable,â€? Stevenson suggested, highlighting the so-called â€œaffordable by designâ€? approach. â€œThe city requires a certain percentage of housing to be affordable to moderate incomes, but I suspect most downtown developers will choose to pay the in-lieu fee instead,â€? Mayor Romero said. â€œMost housing downtown will be quite expensive. We need all kinds of housingâ€”not just workforce. People need higher-quality housing to move into.â€? Planning officials acknowledge that nighttime noise downtownâ€”especially from live music concertsâ€”could create a problem for residents of new nearby hotels or condos. â€œI donâ€™t think weâ€™re getting into this to shut down entertainment downtown, but how to live together is an issue,â€? Davidson said. His report to the city council suggests that nearly three-quarters of the existing buildings downtown will not be going higher in the next five years, so raising the height limit now would only affect around 30 percent of the downtown core. The key to the proposed redevelopment is design, the city council has been told by local architects. Stepping back multi-story development like a layered wedding cakeâ€”with higher parts in the middle of the blockâ€”can help preserve some views and light near the corners. â€œThese are way far away from done deals,â€? said Claire Clark, the cityâ€™s economic development director. â€œThere will be an opportunity for people to get involved. If the public says three stories, the city council will listen. Thatâ€™s their job.â€? As for the idea of killing the goose, Clark admits that itâ€™s a fear for some. â€œDifferent people fear different things,â€? she said. â€œSome fear a lack of progress to allow for growth. Others fear change itself. From an economic development point of view, thereâ€™s an underlying belief that cities need to change to stay viable. But we have a process for a lot of voices to be heard. Whatâ€™s enough? Whatâ€™s too much? How high? We can come to agreement.â€? All of these projects, though, are likely to go ahead unless thereâ€™s a public outcry about the loss of city scale as locals have known it, according to Richard Schmidt, an architect and former city planning commissioner. Various public hearings are set for this summer and fall, including meetings of the cityâ€™s Cultural Heritage Committee, the Architectural Review Commission, the Planning Commission, and the city council. Interested people who donâ€™t want to be forced to peruse the small print in the legal notices of the Tribune can ask the city clerk to be placed on a mailing list for notification of the hearing dates. Ultimately, as Stevenson pointed out, the decision will likely be a compromise between maintaining downtown SLOâ€™s views and small-town charm, assuring ongoing economic vitality, and accommodating more housing choices for people. Kathy Johnston is a freelancer for New Times. Send comments or ideas to kjohnston@newtimesslo.com.